Cheshire West and Chester Council has brought the final part of its weed spraying programme forward due to the increased weed growth caused by this year’s exceptionally warm summer. Weed control starts in late spring/early summer, with a follow-up in September, but StreetCare Services teams have started the final phase a month earlier, due to strong weed growth across the borough. Weeds can grow in between pavements and at the roadside, reproducing quickly and aggressively causing damage to drains, pavement and road surfaces if not kept under control. They are also very drought resistant. The only way to tackle them is by spraying weed killer annually. 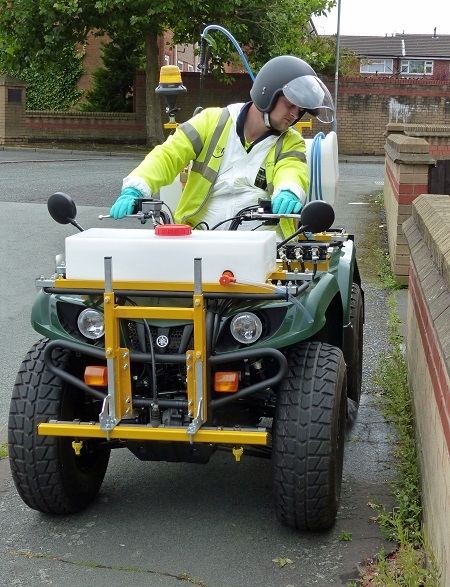 StreetCare Services staff will be out and about over the next few weeks using quad vehicles to spray the borough’s streets and pavements, plus a specialist contractor will work on larger, open spaces. The use of quad vehicles allows teams to ‘spot-treat’ particular problem areas. The Council’s Cabinet Member for Environment, Councillor Karen Shore said: “In addition to our normal street cleaning schedule, the borough-wide weed spraying programme usually take place in late Spring and then again in September. The recent hot spell has created a surge in weed growth so we’ve started our final operations to control them a little earlier. “Weeds are sprayed using a suitable herbicide, similar to ordinary garden weed killer that won’t harm pets or the environment, providing the weather is not too windy or wet. Conditions should be dry and calm when spraying the weed killer but wet weather may delay the treatment and make it less effective. If weeds are a problem in your area, you can report it via the ‘Your Streets’ website.